Comparing the past and present is a perfect theme for the month of November. I fully believe it is beneficial for the kiddos, too. It helps cement new concepts. Encourages “buy in” and involvement. It allows full immersion into topics that may otherwise be a little abstract. It’s beyond “setting” a stage – it is full immersion. The theme must be meaningful, carry academic weight, and last quite a bit of time. Our first grade team’s school year is designed around our social studies and science standards. Our themes last an entire month and coincide completely with those standards. You can read more about our thematic teaching schedule on my backwards planning series. November is a super fast, short month for us. It’s also extremely busy. We will go on a field trip this month to an old ranch where the kids visit what life was like in the past. We wash clothes using a wash board and bucket and hang them to dry. The kiddos make ice cream, tortillas and butter by hand! And eat all of that, too! The house is kept as it was. The kids learn about life without a bathroom or even a bedroom! They learn about chamber pots, cooking with a wood burn stove and chores. There are a few animals to feed and old farm equipment to look at. It’s a marvelous field trip. If you are in the Southern California area, I highly suggest you check out Jensen Alvarado Ranch! During this unit of comparing the past and present, we talk a lot about how life has changed – yet our needs have remained greatly the same. We begin with a look at how housing has changed over time. Although we investigate all sorts of shelters, we create a teepee (because it’s the easiest to make) and a model of modern homes. The home assignment is more than just a craft. We use it as a model to look at what’s important to us about our homes today and how that may be the same or different from the wants and needs in the shelters of the past. After that, we talk a lot about transportation and how inventions have made moving from one place to another so much easier. This canoe craft accompanies an expository writing assignment wherein the kiddos describe what they would enjoy seeing back in the time before modern conveniences. There are differentiated lessons in this unit to meet the needs of K-3 students. 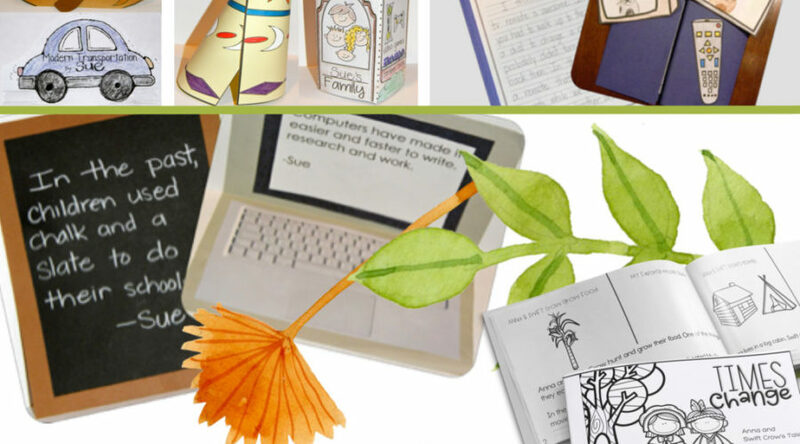 The writing lesson included in this resource offers opportunity for differentiation. The paragraph results from this type of writing plan range from simplistic to advanced. The car representing modern transportation is actually an interactive reader. It’s an effective little reader and it works perfectly as a past vs present comparison for transportation. This little car book looks awesome on our bulletin board; driving along the streets flanked by our modern houses. One of the crafts the kiddos enjoy making the most is the laptop computer. We spend a lot of time talking about classroom tools and how they’ve changed a lot over time. We explore how inventions have made our lives easier. The kiddos in our 2nd grade classrooms have taken this activity to the next level with the more advanced writing lessons and make lengthy expository reports on the modern invention of their choice. Several black lines are included in this resource, and children are also encouraged to come up with their own ideas, or to explain precisely how these modern inventions have affected their daily lives. Each month I put on my focus wall vocabulary words that we will cover throughout the theme. November’s changing time theme is no exception. All of my vocabulary words for each month are laminated and have sticky magnet tape on the other so I can easily throw them up on the white board and remove them and move them with ease. All of these activities are part of the Our Changing Times resource which includes a variety of writing plans, lessons and craft black lines. Children enjoy the transformation of the room each month and the fact that all that they work on relates to one another. Reading and writing are no exception. This month we will be practicing these skills using the Times Change resource. A true favorite is this Times Change interactive reader. In it, students compare their life today to the lives of children who lived here a couple hundred years ago. They discuss food, transportation, chores and housing. In addition to this reader, there is a complete, differentiated writing lesson about how times change. I usually hang the finished product on the bulletin board along with the slate and laptop projects from the Our Changing Times resource. Each month I change out as much of our word work “games” as possible so that the kiddos don’t get bored. As with everything else, I keep them immersed in our topic for the month. Although this little card game is more about using reading skills to identify new words as well as build fluency and vocabulary for my ELLs, it also reinforces the social studies concepts we discuss daily. Even more important, the kiddos LOVE it. This is another way to ensure we are fully immersed in the subject matter while working across curriculum. The cards can be used in a writing center, as a matching game, in a pocket chart and as a card game. During independent work time, students work on these themed activities. Again, keeping this theme focused across curriculum helps solidify understanding AND increase ability in all areas. Find the feather is a fun math game where students practice and advance their skills in fact families, number bonds, missing numbers, addition and subtraction. Developing skills in understanding math stories is essential. Students are encouraged to use the boxes on the right side of this page to “map out” the story and fully understand what is being asked. Working on word problems in this manner is essential for thorough understanding. I don’t ask the kids to look for key words, but rather “picture” what the story is telling them so they can decide whether to add or subtract. Both units are more than enough to fill the month of November and support a comparing past and present theme or unit of study. They are available in a $$ saving bundle, too! This bundle contains so much! Combining it with our core curriculum fills our days in November with tons of fabulous and engaging learning. I hope you enjoy it! Head over and check it out in my store. Love the three day weekend too!!! 🙂 This unit will be perfect for our past and present social studies unit!!!! It looks great! Thanks!!! Have fun tomorrow!!!! Yeah, the good old days weren't always so good! THis unit looks fantastic…hope I am one of the lucky ones! Aren't 3-day weekends the best? I didn't dread Sunday coming and going, and truly felt like I got to unwind a bit. Maybe we should have 3-day weekends EVERY weekend?! Your new unit looks fabulous! I love the little canoe kids! This unit looks great! I love how it works so well with incorporating Native Americans and pilgrims. Your unit looks great! 🙂 I had to work today, but we get Friday off… not sure why, but I'm not arguing! This looks like such a fun unit! I can't wait to use it! Your field trip sounds like a lot of fun. I love doing stuff like that! Your unit looks great! Would love to try it out. Washing on washboards?!? How fun!! Glad you got some hard-earned rest!! What a very cool unit and how fun to teach! Wish our social studies units were a bit more exciting like this. And what a fun field trip. Enjoy your day of leisure and the light week ahead! I can't wait to get myself this organized! I can't wait to get this and dig in!